Bolognese food is some of the best in the world, and Italy’s culinary heartland is rightly proud of it. There are so many wonderful local dishes and ingredients, from Bologna itself, and from nearby Emilia-Romagna towns – including Modena and Parma. These fried, light-as-air, hollow triangles of puffy bread are perfect for stuffing with squacquerone, the local soft cheese, as an aperitivo snack. Tigelle is a typical small round of bread about the size of a crumpet. They’re marked with a pattern made by the metal mould they’re cooked in. This Bolognese bread is best served warm, stuffed with cunza, a pork spread flavoured with garlic and rosemary, although they’re just as often eaten with salami, mortadella or soft cheese. You’ll see them sold in packs. This super-soft fresh and creamy white cheese has a slight tangy taste. It’s perfect – and dangerously moreish – spread on bread, accompanied by a few slices of prosciutto crudo. This is tagliatelle pasta with Bologna’s trademark ragù sauce. It is never, we repeat never, served with spaghetti in Bologna. The official ingredients are a mixture of pork and beef mince, carrots, onions, celery, tomato paste, a little wine (red or white), and sometimes milk, plus seasoning. Surprisingly for Brits, Italians don’t put garlic in their ragù. The secret for a rich meaty ‘Bolognese’ sauce is to simmer it gently for at least 2 hours, adding a little water if necessary. This focaccia style bread comes in a flattish oval shape. It’s dotted throughout with pieces of prosciutto crudo, pancetta, mortadella, or other hams. This world-famous Italian dish has its roots in Bolognese ragù, the very same sauce used for Tagliatelle Alla Bolognese, plus a helping of béchamel. Traditionally, it is made with green sheets of lasagne (lasagne verdi), made by adding spinach to the dough. However, you will also see plenty made with plain egg pasta, too. The story of this pasta shape goes back to the 15th century. It is said that a Bologna innkeeper spied Lucretia Borgia through a keyhole but all he could see was her navel, so he created a delicate navel-shaped pasta in honour of her beauty. However, some say it’s inspired by the navel of Venus. Whichever is true, the result is delicious. The mini pasta parcels contain a mix of cooked pork mince, prosciutto crudo, mortadella, and Parmesan. They’re traditionally served in a clear broth ‘brodo’, but can also be simply tossed in butter, or in a cream sauce. If making your own is daunting, freshly-made ones are available in many Bolognese shops. Bologna’s most famous sausage, mortadella, is made from dry-heat cured pork, containing at least 15% pork neck fat which is dotted in cubes through the meat. Mortadella is pale pink in appearance and soft-textured, and can be flavoured with a variety of additional ingredients, including peppercorns and pistachios. It’s used sliced as a simple antipasti cold meat, or served with bread, as well as in pasta fillings and in other meat dishes, too. You’ll also find it on top of pizza in Bologna. Similar to Parma ham, culatello is from the back muscle of the pig’s leg, but is cured off the bone inside a natural casing before being aged in brick cellars. The flavour is more savoury than Parma ham, and can be peppery and aromatic with a chewy texture. Parma, also here in Emilia-Romagna, is not far from Bologna. This town produces the world-famous ham, but it is widely available in Bologna food shops. It’s cured on the bone and has a wonderful sweet flavour and tender texture. Translated as Bologna cutlet, this is similar to a Wiener Schnitzel. It’s made with a thin slice of veal rump, beaten out then dipped twice in beaten egg and breadcrumbs and fried in butter. It then has a slice of prosciutto crudo and a layer of Parmesan (or sometimes local pecorino) placed on top before being put in the oven for the cheese to melt. At this stage a little meat broth is added to the cooking tray, which makes the crispy outer layer soften. A version with truffle shavings is known as Cotoletta alla Petroniana, Petronius being the patron saint of Bologna. This sauce, made from sweet local white onions, olive oil and tomatoes is used as a topping for bread, pork, or polenta. Along with various other Bolognese dishes, the original recipe is protected in the local chamber of commerce. The best of Italy’s famous vinegar comes from Modena, a few miles up the road. Many visitors to Bologna want to buy a bottle of the real stuff. Try Enoteca Italiana, Gilberto or Tamburini or Bologna’s food markets. 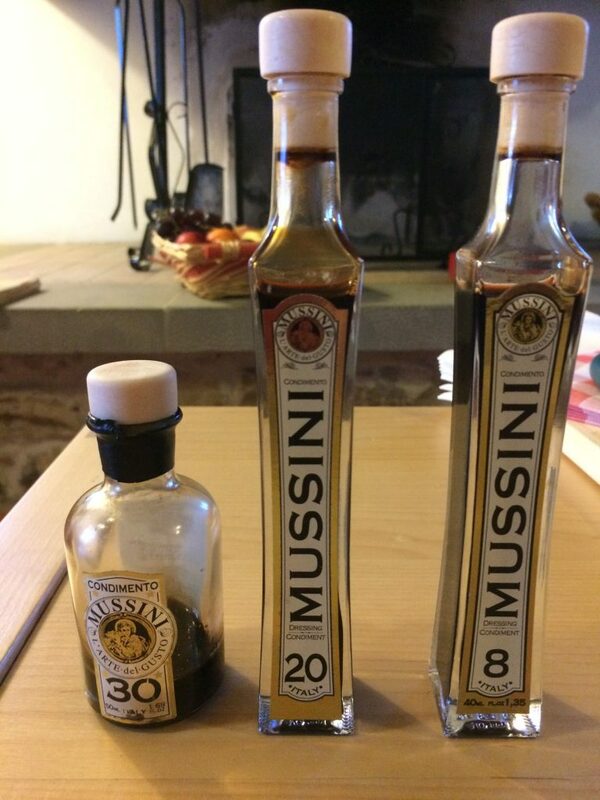 There are strict EU rules about what can be classed as Traditional Balsamic Vinegar. The grapes must be from Modena, for starters, and the way it’s made is strictly controlled. Knowing what you’re buying is a confusing business, and the trick is to look at the ingredients, the age, and always try before you buy. Aceto Balsamico Tradizionale – The real deal and most expensive. It has a DOP stamp (Denominazione di Origine Protetta). It is either affinato (fine), usually 12-years old; vecchio (old), 15-20 years old; or extra vecchio (extra old), up to 25 years old. Balsamico Condimento – This won’t have DOP, but should have an IGP stamp (Indicazione Geografica Protetta). Some condimenti are excellent, but may miss DOP status just because they’re under 12 years old. If grape must is the only ingredient, that’s a great sign. Some contain added wine vinegar to balance the acidity. It depends on how much is added as to the quality of the finished product. Balsamic Vinegar of Modena IGP – IGP guarantees it’s from the right grape varietals: Albana, Ancellotta, Fortana. Lambrusco, Montuni, Sangiovese, and Trebbiano. There is no fermentation stage, and wine vinegar is added to bring the acidity level to at least 6%. It may contain thickening agents, caramel, or colours and could be under 5 euros or over 50 euros per bottle. These Bolognese meatballs are made with veal meat, mortadella, Parmesan, eggs, breadcrumbs, and milk. They can be cooked in tomato sauce or deep fried. They’re not served with pasta, but as a main meat dish. These are sweet ravioli cakes, made with a pastry of flour, egg, sugar, and butter, filled with a spiced black plum jam, then baked in the oven. The traditional filling is called Mostarda alla Bolognese, which is a jam of apples, pears, plums, nuts, and raisins plus a dash of mustard.